The most unusual thing about Jeremy Lin is not that he is an Asian American basketball player. Nor is it that he's a Christian basketball player—his preferred self-identification. It's that he grew up a Warriors fan. Given Lin's age, those were some lean years, that one marvelous upset of the Mavs notwithstanding. Run-TMC was not walking through that door. For the longest time, the most exciting thing about the Warriors was those pre-game introductions where they seemed to giggle about Stephen Jackson's off-court troubles. (Genius, still.) Growing up in the Bay Area in these leanest of years didn't insure an instant connection to the Warriors, either. I recall one night at a youth center I was working at in Oakland. A Warriors rep from down the road came by and dropped off an array of Bolt-festooned goods to encourage our kids to stay in school and the like. We dangled said goods as prizes for some schoolwork-related activity, and their level of motivation seemed to plummet. I'll never shake the look one student gave me, as though he felt sorry for me for having to hype these Warriors-branded folders, backpacks and tees. 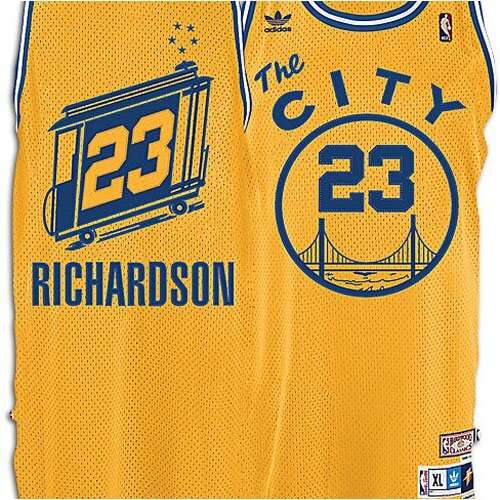 Hand-me-downs and charity were one thing; Warriors gear plumbed a new low in "undesirable." With a new logo--honestly, they should just wear their throwbacks full time—a potentially fascinating mixture of players and a fairly insane coach who I can easily see starting Lin, maybe the Warriors are back on the right track, that track being "toward the eighth spot in the Western Conference." But at the very least, they've got the Bay Area's robust Asian American population on their side. Who knows if the next Jeremy Lin lurks among them. Perhaps, as some have speculated, this is the reason the Warriors signed him. If so, then it will have been a crass, short-sighted move...and yet it at least demonstrates a bit more awareness than usual from the Warriors' front office. As someone who grew up seeing very few Asian Americans on television, I still find myself mystified, even thrilled, whenever I come across one, even if my views on media representation have softened. There's something irrationally and inexplicably bemusing about these moments. I think part of the reason I'm less interested in the mere fact of representation is captured in something like K-Town, the "Asian American Jersey Shore," a series which might potentially put to rest any worries anyone ever had about Asian Americans being underexposed on television. Personally, I can't wait. To swap one set of stereotypes for another: does this not merely point out the ultimate inanity of stereotypes, the malleability of media identity, etc? These shows are designed to be consumed ironically, and in the case of K-Town, which re-stages and play-acts the original, we have one that seems like it was made ironically, too. Or so I hope. Either way, I will be watching. And, in an adjacent window on my laptop, working on a spec script for Basketball Wives: Asian-American and Christian.